2014 Celler Frisach, Vernatxa Blanca “La Foradada” Terra Alta, Spain. For over 200 years winemaker Francesc Ferre’s family has been growing organic wine grapes in the Terra Alta region of Spain in Catalunya, south west of Barcelona. This windswept high elevation area is wild and remote, perfect for Francesc to grow Grenache Blanc in ancient solidified sand dunes at about 1,200 feet, his vines are on terraces carved from layers of almost pure calcium overlooking Corbera d’Ebre, the warm days and cool nights highlight ripe flavors and great acidity with the soil giving dynamic mineral layers. 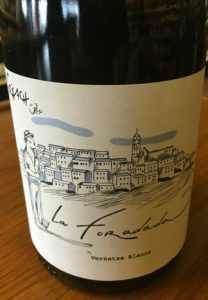 Frisach is making some serious wines, especially this La Foradada Grenache Blanc that sees extra skin contact, this allows the wine to have almost no added sulfur, it’s name La Foradada is from the use of tiny round windows in the ancient buildings of this area, and of all of Francesc Ferre’s impressive offerings it is the most intriguing and expressive. The 2014 Celler Frisach La Foradada Vernatxa Blanca is vibrant and vivid with hints of white flowers and lime with a golden/yellowy hue in the glass and loads of stone fruits, spice and stylish wet slate on the palate, it has the feel of a dry Riesling with hidden extract and energy. Apricot, tangerine, lemon/lime, green melon and tangy peach all meld together along with dusty chalk, anise, peppery dried ginger, saline and mango. The texture is succulent and smooth like a Chateauneuf-du-Pape Blanc, though this wine remains naturally vital with a hint of tannin and minerally crisp and nicely tart, great with food. This is wonderful terroir driven wine that shows charm, passion and fresh excitement, I highly recommend searching out this tiny producer, imported my Trumpet Wines, and drink this white over the next 2 or 3 years!